ARE YOU WASTING THE TALENT GOD’S GIVEN YOU????? In brief, a rich man delegates the management of his wealth to his servants, much as investors in today’s markets do. 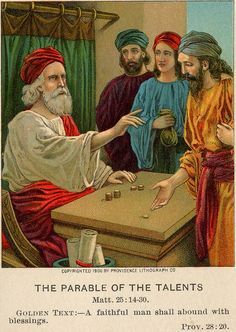 He gives five talents (a large unit of money) to the first servant, two talents to the second, and one talent to the third. Two of the servants earn 100 percent returns by trading with the funds, but the third servant hides the money in the ground and earns nothing. The rich man returns, rewards the two who made money, but severely punishes the servant who did nothing. You may not know what your talent is. If that’s the case then ask God to show you, ask God to lead you to what his plan is for you through Jesus Christ and the Holy Spirit. God has given us all special talents and capabilities. These God given gifts include skills, abilities, family connections, social positions, education, experiences, and more. God’s plan is for us to prosper them, grow them, harvest them. He doesn’t expect you to do it by yourself. He wants you to always improve and build on what you already have and ask people to help you prosper them. God doesn’t expect you to remain stagnant either. Your talents may lead you in different directions because you have grown in wisdom but in any case His intention is for you to use those gifts in His service. The return God expects of us is commensurate with the gifts we have been given. The servant who received one talent was not condemned for failing to reach the five-talent goal; he was condemned because he did nothing with what he was given. The point of the parable is that we are to use whatever we have been given for God’s purposes. God expects us to “spend” generously or “invest” wisely. Are you using your God given talent or wasting it? IF WE COULD ALL DO LITTLE THINGS IN A GREAT WAY……..